The controversial award shows signs of growing up. 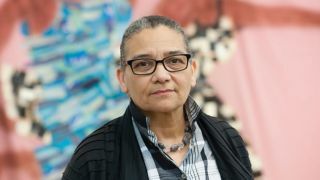 Yesterday saw Zanzibar-born artist Lubaina Himid win the 2017 Turner Prize, becoming the oldest person and first woman of colour to be given the award. The 63-year-old Preston-based artist is known amongst curators, artists and cultural historians for her work that tackles challenging subjects including colonial history and racism. The £25,000 prize comes as long overdue recognition for Himid, who has often been overlooked by mainstream critics in the past. Himid was named the winner of the 2017 Turner Prize at a ceremony in Hull, the current UK City of Culture, last night. Her entry featured work that dates back to the 1980s, including wooden figures, pottery, and editions of the Guardian which Himid had painted on. The centrepiece of her entry though is a diorama called A Fashionable Marriage. Created in 1987, the artwork is based on William Hogarth's Marriage a la Mode and features cut-out characters of Margaret Thatcher and Ronald Reagan. Accompanying them is a porcelain dinner set sourced from a junk shop which Himid has doctored by painting images of black slaves and aristocrats. Other objects were painted over by Himid in her entry exhibition, including covers torn from her favourite newspaper, the Guardian. These mixed media pieces examine unconscious racial stereotyping and explore whether accompanying headlines are in fact perpetuating caricatures. During her acceptance speech, Himid thanked art historians who had written about her work for decades, and for helping her through a creative 'wilderness years'. Himid's recognition is timely, as this was the first time since 1991 that artists over the age of 50 were eligible to be considered for the Turner Prize. The award has been the subject of controversy in the past thanks to outlandish submissions by notorious Young British Artists, but by bestowing the award on Himid it's a sign that the prize is becoming more serious and sophisticated. Other artists on the Turner Prize shortlist include 52-year-old Birmingham painter Hurvin Anderson, filmmaker Rosalind Nashashibi, and Andrea Büttner, who works in printmaking, sculpture and archival projects.